Ireland as a State (and many Irish people) view the diaspora inwardly. In other words they see the diaspora as providing an inward flow of benefits to Ireland (largely economic), achieved through activities such as tourism and investment. Many who hold this inward view see the diaspora as a group attempting to reestablish cultural connections to Ireland and their ‘Irishness’ that were broken when their ancestors left the country. Fundamentally, this inward perspective regards the diaspora primarily as a resource. Conversely, an outward view incorporates the history and experiences of those who emigrated with those who remained in Ireland, forming an integrated cultural and historical picture of the Irish people. Rather than regarding emigration as creating a defining break with Ireland, it recognises that the millions of Irish people who lived (and live) in communities abroad have stories that should be told in Ireland and that their experiences have just as much validity as those who stayed on the island. This outward view can also derive economic benefit, as embracing this integrated cultural history provides the Irish State with an opportunity to increase it’s visibility in the countries of the diaspora, by participating in occasions which remember specific events that impacted upon the Irish living there. It is normal for a country to see its diaspora as a source of potential benefit and to have a primarily inward focus. However, when not balanced with a strong outward and more culturally inclusive view it sends a message that the heritage of the diaspora is not regarded as part of the central story of Ireland. Ireland is not good at outwardly embracing her diaspora and the opportunities that doing so creates. This failure runs the risk of distancing Ireland from those of global Irish heritage and ultimately can foster a belief among people in Ireland that the diaspora have a lesser claim to ‘Irishness’ and Irish heritage. As regular readers of this blog will be aware, I regard the vastly disparate treatment of World War One and the American Civil War in Ireland as an indication of how we are failing to appropriately engage with our diaspora’s history and heritage. They are the two largest conflicts in the Irish military experience by some distance, witnessing similar numbers of Irishmen in uniform, similar casualty rates and similar impacts on Irish communities at home. We are currently in the midst of the 150th anniversary of the American Civil War, while the 100th anniversary of World War One is less than a year away. I am fully supportive of the efforts to mark the centenary of World War One and believe that all the activities planned are right and proper. It is a topic on which I have worked extensively in the National Museum, have published on and on which I will be giving talks on as part of the 100th anniversary. However, I view the differential treatment that the two conflicts are receiving from the Irish Government, Irish media and Irish educational institutions as indicative of a wider failure to appropriately acknowledge the history of Irish emigrants and the diaspora generally. There is little doubt that the 100th anniversary of World War One should be expected to be a bigger event in Ireland than the 150th anniversary of the American Civil War. There are a number of reasons for this- it is 50 years closer in time to us, was a worldwide event, was more visible locally, descendants of combatants grew up in Ireland (as opposed to descendants of the American Civil War Irish, who grew up as part of the diaspora), it was one of the major events that formed a backdrop to the Irish independence struggle, and it has continued relevance for the Peace Process. So a disparity is to be expected in terms of how we remember them now. However, the American Civil War also has much relevance. Many of the 170,000 Irish who fought were Famine emigrants, tens of thousands more were the children of Famine emigrants. 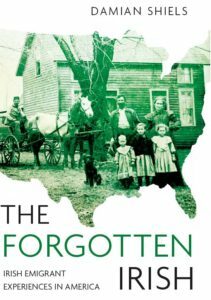 The 1.6 million Irish-born people who lived in the United States at the time had a profound impact on that country and their participation in the conflict was used by the Irish-American community to aid their own (and future) Irish integration into the United States. So although we might expect a disparity, it is also fair to expect that there would be a serious focus on this conflict at the time of the 150th anniversary. Instead, what has happened in Ireland is that the American Civil War has been largely ignored; in contrast to the dozens of events already planned to mark World War One. I spend much of my time looking at the social impact of the American Civil War on Irish emigrants, mainly through documents such as Widow’s Pensions Files. While attempting to be dispassionate from a historical perspective, it is impossible to read hundreds of these often heartbreaking stories without being strongly affected emotionally by them. They may be largely forgotten here, but these were Irish people and their history is Irish history, just as much as it is American. Their story should form a major part of what we understand to be Irish culture and heritage and should be embraced accordingly. For us to fail so badly in remembering them appropriately is an indictment of how we view our emigrant communities. This is true of our emigrants in Australia, Canada, New Zealand and elsewhere just as much as the United States. Cherishing a diaspora is a two-way street. if, as Tánaiste Eamon Gilmore has said, ‘enhancement of our connections to the global Irish community remains central to Government policy’, then Ireland needs to do a lot more to prevent Article 2 of our constitution from ringing hollow. Delaney, Enda 2011. ‘Directions in Historiography: Our Island Story? Towards a Transnational History of Late Modern Ireland’ in Irish Historical Studies 148, November 2011. Well, Damien, you’ve made a well-considered and thought-provoking article that I hope will set people thinking. I shall certainly pass it along to those I know will share my appreciation of what you have written. Thank you. 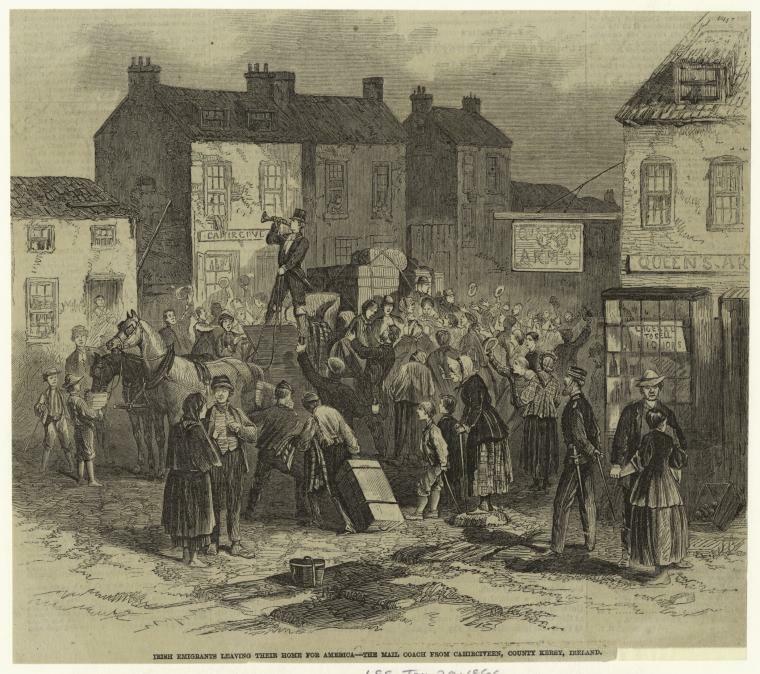 And the illustration of Irish Emigrants Leaving for America from Caherciveen, Co. Kerry, 1866 (New York Public Library Image ID 833634) is one I have never seen before and shows what a dab hand you are at ferreting out important and informative pictures of the diaspora. Many thanks I appreciate that! It is a fantastic image alright, the New York Public Library has a really good bank of images, and is well worth checking out! My name is Cathe Lester and I live In Texas and work with Simon Linnell in Kenmare researching and writing about Kenmare descendants. My interest is in those who served in the Civil War. My paternal grandfather came from Kenmare to the US in 1923, settling in Boston, and my father served in the US military, thus my interests. I ran across a newspaper article (October 21, 1865) that mentions Captain Dennis Downing and his continued participation in the Fenian Congress that was held in Philadelphia in 1865. I’m also attaching copy of a letter that Captain Downing wrote to the Adjutant General in November 1866 accepting an appointment as a 1st Lieutenant in the 44th US Infantry. I think you were interested in where Captain was buried and I don’t know if Simon was able to get back to you on this but I found a web page there in Ireland that says Captain Downing was buried in Chapel Yard in Skibbereen (http://www.southernstar.ie/Co.mmunity/My-Own-Town/Skibbereen-men-in-the-American-Civil-War-29012013.htm). My background is in research and from time to time, I can find records of Irishmen who fought in the American Civil War, some in WW1, although many of the records for these men and women were destroyed by fire. If you would be interested, I could send you what I find, if I can find complete records that track them from Ireland to the US to the war. I’m currently working on trying to find more complete records of four Irishmen who fought in the American Civil War, two who died in Andersonville, two others who died of disease. Regards, Cathe Connor Lester, Ph.D.
P.S. I loved the introduction to the Donohue/O’Sullivan, Brennan, and Downing piece you did for Simon. I also very much like your post below. Many thanks for getting in touch! Also many thanks for passing on that information and his burial location- I am going to make sure to check it out the next time I am in West Cork (I live in East Cork). I am always interested in hearing what people discover with regards to the Irish experience, so please do let me know how your research goes, and if I can be of any assistance don’t hesitate to let me know. In terms of the Irishmen you are looking into at present, were they also from the West Cork area? Hi Damien, I am interested in researching thomas McGirl and his brothers whose mother emigrated from Ireland. Think they settled in Lexington Missouri and they fought in the american civil war. Any suggestions / ideas on best places to look online ? Many thanks for getting in touch! You are onto a winner straight away with such an unusual surname- only three men are recorded with that name (although you have to allow for misspellings as well). They are Barny McGirl of the 2nd Kansas Infantry (a 3 month regiment in 1861), Francis McGirl of the 164th New York (part of Corcoran’s Irish Legion) and most hopefully John McGirl on the 27th Missouri Mounted Infantry. A Thomas McGirl (born 1858 in Leitrim) enlisted in the regular army in Memphis, Tennessee. As for John who was in the 27th Missouri Mounted Infantry, he was 30 in 1862 and had joined from Johnson County, Missouri. He was recorded as having been captured at Lexington on 20th September 1861. Might any of these be the people you were looking for? Also worth checking the 1860 census on ancestry for Irish-born in Lexington- I had a quick look and McGirl isnt recorded, but it was probably spelled incorrectly on the return. Congratulations on your doctoral program! If there’s anything I can assist you with over here, please let me know. My focus has been on Irishmen from Co. Kerry. At this point, I haven’t been able to find exactly where these Irishmen came from in Ireland, only that they were from Ireland. As you know, it’s always such a long process to find a “complete” trail when searching through time. Did you find his burial location? I believe he may have lost two other brothers in the American Civil War. Again, let me know if I can help you with anything over here and I will definitely contact you when I need assistance. Many thanks and I appreciate the offer! It is the major element to try and find where they are from in Ireland, which often proves an impossible task and is something that is rarely achievable. There are a lot of interesting characters from Kerry during the Civil War, have you come across many from the county? I’m currently working on finding 3-4 Irishmen who fought and just ran across an Irishman from co. Tipperary who was a Colonel and killed at Gettysburg. Just can’t get enough time to do what I really want to do–work exclusively on this! Maybe over the holidays. I appreciate your posting all the resources you use for locating these men and their stories. It has been most helpful. What was the name of the Colonel? I might be able to provide you with some information on him- I am in a similar boat, I would love to just spend all my time researching them! I am really glad you are finding the site of use, that is good to hear and if I can be of any further help don’t hesitate to contact me. Would it okay to email at the irishamericancivilwar@gmail address you have posted? Thanks for the comment and I am glad you enjoyed the book! I agree with you- I think all of the diaspora, wherever they are/were, have been consistently let down in Ireland. There is also certainly a focus on North America in efforts to derive economic benefit from the diaspora, but as I argue in the piece this does not extend to actually celebrating and commemorating the Irish experience in the the U.S. or Canada. Rather the diaspora is encouraged to celebrate and commemorate Ireland, with little in return. There is nothing wrong with encouraging the diaspora to come to Ireland as long as there is a balanced approach, but it seems to me there is not. There are strange anomalies in all this, for example our seemingly never-ending desire to claim famous people or celebrities as Irish (e.g. Barack Obama and more recently Tom Cruise). This type of activity strikes me as a bit superficial and odd, I am not sure where the desire to have everyone as ‘one of our own’ comes from. It is a pity it doesn’t extend to some very relevant historical figures in the diaspora! This is great stuff, Damien. Fantastic. Many thanks- I wonder will anything ever be done to change the insular view we have in Ireland. I certainly hope so, it is long past time. Thank you for this post, Damien – as a descendant of the diaspora I truly appreciate it. It rings true as a generalization, but I’ve found many Irish who appreciate those returning diaspora who have done their homework and know something about the history of the country they come from – who come wanting to learn. As ever thanks for reading! You are right, there are many Irish people who are very engaged with the diaspora in that sense- hopefully something that we can continue to grow! As a descendant of Irish immigrants I much appreciate your post. My great grandfather Patrick Breen was a Kerry native and famine emigrant who had a long career in the regular U.S. Army (1855-1877) which included service throughout the Civil War. Of course he was only one of many, as you know. Another great grandfather of mine was Thomas Shea, son of Michael Shea, both of County Kerry. According to an account in old newspaper article, Michael Shea’s childhood home was Caherciveen, Dromah Parrish and he went to school with Daniel O’Connell who was 6 years older. Michael Shea married late and ultimately emigrated to the U.S. in 1864 with his son James. Michael, James and Thomas were all blacksmiths by trade. (Michael lived to be 117.) Patrick Breen became a railroader following his military career as did 2 of his sons. Ditto for some of the Michael Shea sons. That leads me to make the observation that if you multiply my Irish ancestors by the many others who came to his country when its frontier was expanding, it is clear that Irish immigrants played a major role in the expansion of the U.S. Many thanks for the comment. You have some fascinating detail there on your ancestors. Patrick must have witnessed some events- do you know what units of the regulars he served in? I have spent sometime in Caherciveen, I hope you have had the opportunity to visit, it is a beautiful part of the world. When I was researching the Fetterman Fight Irish casualties in particular I wondered about the incredible culture shock that many men must have had going from areas such as this in rural Kerry to places like the Western Plains as part of the regular army- it must have seemed like a different planet. I would love to hear more about your relatives! My only information is that Michael Shea, Michael, Jr., Thomas (my great grandfather) and daughters of Michael Shea emigrated to the U.S.A.
Greetings Don from New Zealand .. I have been searching my elusive Thomas shea family for 40 years .. I have Thomas and Nellie Miles having 10 children near callan Kinlkenny .. I do have bap records with sponsors names..the children were born 1820 — 1840,,I just cannot find them after that..My grt gf was Edmund born 1829 .. was in Aus in 1853 and Married in NZ 1869..Just cant find Any Shea or Miles …and wonder if they went to USA or Canada…as the story goes they disappeared overnight from Ballylarkin or Whitesland…. According to the account first mentioned, Michael had 5 children: Thomas, Julia, Mary, James and Michael. Sometimes they returned to Ireland. I’m hoping to delve deeper next year but my great grandfather emigrated to the USA sometime during the famine and he became a naturalised US citizen in 1867 in Connecticut. What he did during the civil war, how he made his money and then returned to buy land in Ireland is what I need to discover. I enjoy your very informative blog and this entry is certainly thought provoking regarding Irish views of the diaspora. For a long time I chose stop visiting Ireland because of the insular attitudes of some people. However, I came to realise I was cutting off my nose to spite my face and missing seeing family and my need to have the above questions answered. So it’ll be trips to Ireland and to Connecticut. Thanks for the comment- I am glad you enjoy the site! Indeed they did- I am particularly interesting in looking at those who did return. What are your great-grandfather’s service details? I may be able to help you in your search. Is he buried in Ireland as well? I am developing a project which may be of interest to you and your readers. The project is entitled the National Genealogy Centre and we wish to develop an attraction which will tell the story of the Irish in the country they settled in, who they were, where they went, when, how and why. We would like to build a data bank of stories families have been told about Ireland and their ancestors. We would like to understand what is the folklore that has been passed down, what culture survived the ages and what is the position today. We are developing the plan at present for launch in 2014 and hope to develop the attraction over the following five years. We expect this will cost upwards of 30m and will in addition develop other resources that the Irish overseas would wish to have to assist them in creating their family history. We will be developing a significant online resource in that regard in 2015. Many thanks for this it sounds like a fascinating project I wish you every success with it- if I can be of any assistance please don’t hesitate to contact me. Irish in the Civil War caught my eye on a Google search and I thought I would jump in with a comment or two. My Great Grandfather Michael Tancred served in the US Navy from June 1863 thru July 4th 1864. He registered for service in Brooklyn NY and served on the East Coast of the Atlantic from Philadelphia to South Carolina.He attained the rank of Fireman 1st class(tended the boilers) and was positioned on the USS Unadilla in the Charleston SC harbor. Michael was born in 1834 in Dublin and emigrated in the late 1850s or early 1860s to NYC. As soon as he mustered out of the service, he opened a bar- saloon -liquor store at 463 Washington St in lower Manhattan. He married Rosanna Ryan(not sure where in Ireland she came) in 1865 and had 5 children. Michael did some side work fixing boilers for friends and others as a means of creating more income. Unfortunately,one of those side jobs proved fatal as the boiler exploded and severely burned him-claiming his life in 1892. As an aside my Gt Gt grandfather John Tancred (1795) also of Dublin via Liverpool made the cross Atlantic trip in 1868 at the age of 73 and 10 months later he died while still in NY visiting his son. Many thanks for the comment and for sharing part of your family story. I have been surprised at how frequently older people went back and forth across the Atlantic in this period, it was much more prevalent than I had first thought. Fascinating about Michael and his service and subsequent life. Somewhere in the region of 20% of the Union navy was Irish born and virtually no work has been done on them- I hope in the coming years to do some focused research in that direction (part of a long list!) as their stories are fascinating.